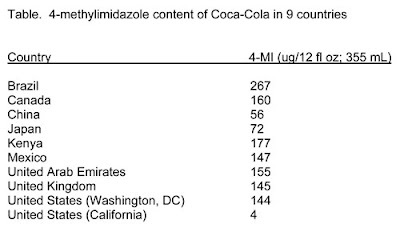 WASHINGTON - (drinks media wire) - Coca-Cola sold in California now contains little of the cancer-causing chemical 4-methylimidizole (4-MI), but new laboratory tests show alarming levels of the carcinogen in Cokes sold elsewhere around the world. The carcinogen forms when the ammoniated caramel coloring used in colas is industrially produced. Coke began using a less-contaminated caramel coloring earlier this year in California after the state required a cancer-warning notice on soft drinks with excessive levels of 4-MI. CSPI first released test results showing the levels of 4-MI in Coke and Pepsi in March. In February 2011 CSPI first urged the FDA to prohibit ammoniated caramel coloring and to use a more accurate term for the ingredient. In contrast to the caramel one might make at home by melting sugar in a saucepan, the artificial brown coloring in colas and some other products is made by reacting sugars with ammonia (and often sulfites) under high pressure and temperatures. Chemical reactions between the sugar and the ammonia result in the formation of 4-MI, which caused lung, liver, and thyroid cancer or leukemia in laboratory animals in studies conducted by the United States government’s premier testing laboratory. A major manufacturer (D.D. Williamson) of caramel colorings says that it offers a coloring that is totally free of 4-MI, but it is four times more expensive and beverage companies aren’t purchasing it. Five prominent experts on animal carcinogenesis, including several who worked at the National Toxicology Program, joined CSPI then in calling on the FDA to bar the use of caramel colorings made with an ammonia process. “The American public should not be exposed to any cancer risk whatsoever as a result of consuming such chemicals, especially when they serve a non-essential, cosmetic purpose,” the scientists wrote. The Center for Science in the Public Interest is a nonprofit health advocacy group based in Washington, DC, that focuses on nutrition and food safety policies. CSPI is supported by the 900,000 U.S. and Canadian subscribers to its Nutrition Action Healthletter and by foundation grants.